As I walked in Cameron's classroom this morning, I whispered to some of the girls that I got engaged!!! As suspected, the girls did what they do best. "Ohhhh how awesome!! Can I get invited to your wedding? When are you getting married?! Hey, Miss Ellie is getting married guys!" But hey, I couldn't help myself! :D I asked for it. Cameron's friends are just too cute. Olivia is such a precocious little girl--sometimes I feel like I'm talking to a peer. 0_o" She knows me far too well from some observations that she's made of my wedding preferences, such as the color scheme, dress style, outdoor or indoor, you name it! I have to say, that dress isn't half bad! Baahahaha. So adorable. 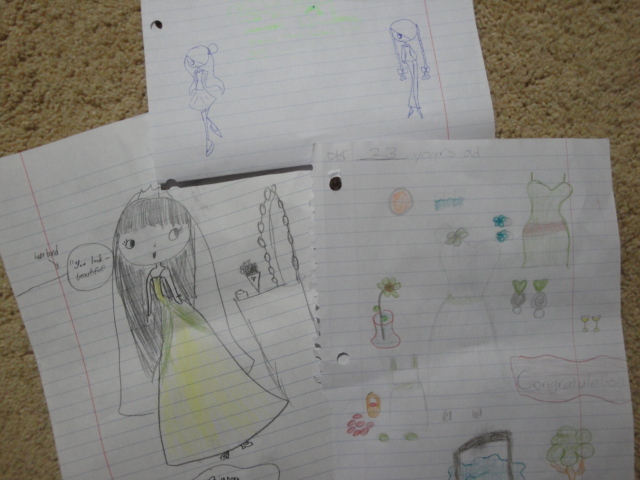 And equally adorable are Sharon and Bianca's illustrations. They're wanting to design my hair style, and they've already invited themselves. Help. For some reason, this thought really moved me because it confirmed once again that we have been pre-wired to long for those things! And it's not wrong to want those things, because God wants us to FEEL LOVED AND BE LOVED. He wants us to know our worth and beauty in Him--not only outer beauty, but the inner beauty within ourselves because we are made in His image. Have you heard of the saying that goes, "Beauty is in the eye of the beholder"? As I sit here typing away, this quote is resonating through my inner most being. So wait a minute...if beauty is in the eye of the beholder, and God, the Creator of everything, is my beholder...then all I need to be concerned about is how He thinks of me! And He thinks I'm darn beautiful! He declares that YOU are infinitely precious and worthy to Him... ^_~ He wants to be our prince charming as funny as that sounds. Sorry I'm turning all mushy here. I don't believe that little girls or grown women should always live in a dream world, but what I'm trying to convey here is that inside of us, there is an unlocked beauty waiting to come out and blossom for the world to see. It is no coincidence that a whole slew of 9 year old girls would feel just the same. Amazing, if I may say so myself! Not to be abrupt, but I wanted to share one of my new food loves!! 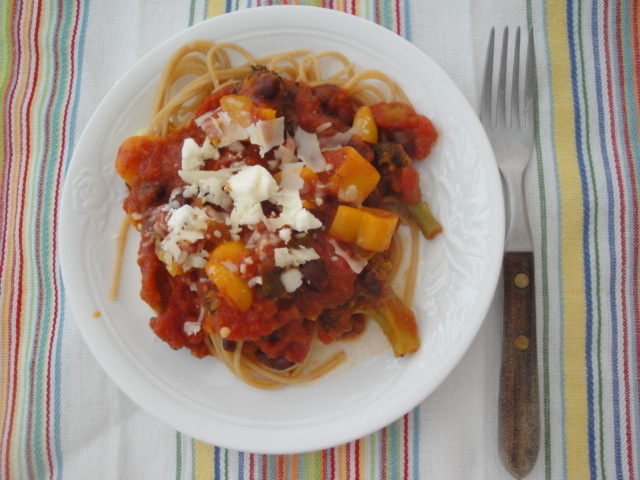 You may have seen this magical marinara sauce on Angela's blog already! It's called White Linen Collections. I have to say, it is absolutely expeealidocious!! It is made of very wholesome ingredients, and it reminds me so much of Argentine pasta sauce! I think I've finally found something at least somewhat close to Argentine cuisine. :D And the best part is, I don't have to pay an arm and a leg for it. So what do you do when life throws you amazing marinara sauce? Why, you make a quick and amazing veggie spaghetti of course!~So, quick spaghetti was made yesterday. Very simple ingredients went into the pot. And I ended up with this beauty within 20 minutes, while serving 5. Gosh, there are so many eats that I've been enjoying lately! I've been running around everywhere from Bible studies, work, meetings, and classes. I realized that I was not taking care of myself that well. It is pretty cool that my school offers this vending machine in the middle of campus. Oy, it even sells tampons. This is Sabra's Classic Hummus With Pretzel Crackers. It is so creamy and delicious. I think it's my fave Sabra hummus next to the Pine nut flavor. As always, I wanted to keep this simple and short but it didn't work. Thank you for keeping up with my ramblings!